Lost amid the debate is the fact that for the first time a majority of Americans say having a gun in the household makes it a safer place to be, according to a new Washington Post-ABC News poll. 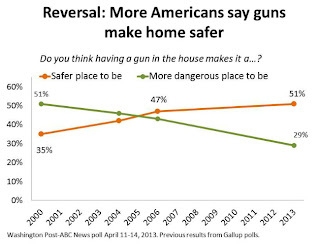 By a wide 51 to 29 percent margin, more people say a gun in the house makes it safer rather than more dangerous. 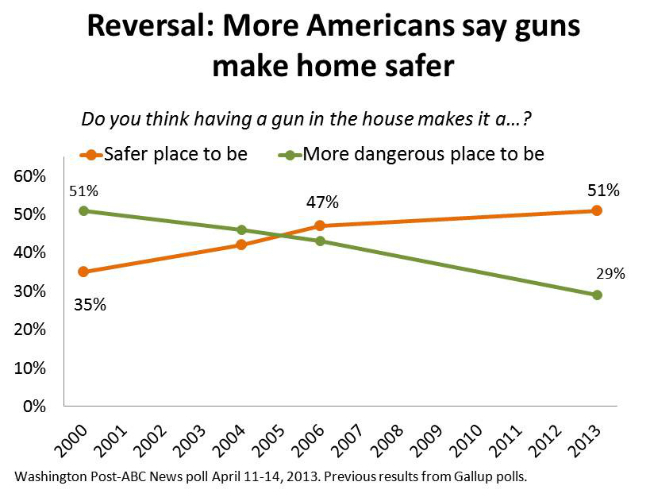 That’s a near complete reversal from a Gallup poll in 2000, when the public split 35 to 51 percent on whether guns make the home safer or more dangerous. People with guns in their homes lead the way in touting the safety benefits: 75 percent say they make the house safer, compared with just 30 percent of those with no gun at home who say the same.